Latrabjarg are basically the westernmost post of Iceland. It is a cliff that accentuates the beauty of Iceland even more. The place is home to various species of birds, guillemots, razorbills and puffins. It is a haven for nature lovers and for bird watchers. You will completely get lost in the beautiful landscape around this place and in the quiet sky that covers up the lovely cliffs. The cliff is famous for being the largest bird cliff in the whole of Europe. Want to plan a DIY trip? Use BÃÃÃ‚ƒÂ­ldudalur trip planner for the same. You won't miss your home when in BÃÃÃ‚ƒÂ­ldudalur, hotels in BÃÃÃ‚ƒÂ­ldudalur like Guesthouse Bjarmaland, Harbour Inn - Guesthouse and Bildudalur Hi Hostel offer some of the best places to stay in the city. Find out how to reach BÃÃÃ‚ƒÂ­ldudalur to begin with. Plenty of wholesome BÃÃÃ‚ƒÂ­ldudalur vacation packages are available to choose from, pick your today! Love this? Explore the entire list of places to visit in Bildudalur before you plan your trip. Fancy a good night's sleep after a tiring day? Check out where to stay in Bildudalur and book an accommodation of your choice. A really unique experience. Quite demanding road, you should be good driver to get there. Beautiful cliffs and outstanding view at wild ocean. If you're lucky, you can see puffins, chilling on the grass. That's actually the goal for almost all visitors: to see these birds. However, it's a long drive from the main road to this spot, so consider if you want to risk your precious time in Iceland to come here and only be rewarded with strong wind, rain and no puffins. You don't have to hike far if you want to get the idea of this place. 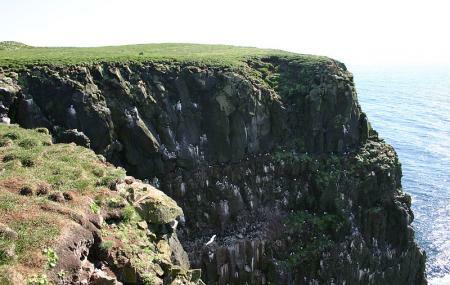 I recommend visiting in summer time because of better chance for a good weather and seeing puffins. It is a very beautiful bird cliff. Being the westernmost point of Europe & Iceland, it also holds a special importance. On a clear day, you can also see Greenland from here. Do not venture out of the marked lines to avoid dangerous pitfalls. The road to Latrabjard isn't great but definitely worth taking a trip.